Please remember galgos are not greyhounds and come from an entirely different background. Using Transportines/Crates as beds…Many a galgo has been rescued from a severely dark place and time in their life. Many many are rescued from dark small hovels, under ground and in some cases with pallets on the top. Some have been rescued from boots of cars where they’ve been kept inside while parked in an under ground parking block. Some, in cages, some in cave type squallers. 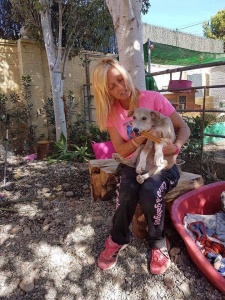 It’s not common to rescue galgos from places which are light and airy and where all their needs are met. When a galgo is rescued 9 times out of 10 they are petrified. Unsocialized with people, they can be scared of pack situations, or they may have come from the streets alone. Living life as best they can having been dumped or escaped from the darker side of life. At 112 Carlota Galgos sanctuary the galgos live in their bays. Each galgo has their own bed, and their own blankets. Each galgo learns their name and the command come, and each one goes to their correct bay and come on command. Some in the orchard grounds where the bays lie, some cannot be touched outside in big spaces, but they all learnt their names and come to the call. It is Paramount. We believe that part of rehabilitating a galgo is that they must “learn to feel safe within themselves” find security within themselves, this is a big part of them becoming comfortable with who they are. A dog first and then a pet. 112 Carlota galgos does not recommend using anything other than open beds for the galgos in our care and when they go home because if they were then in a crate it would erase all the work done to make these souls feel safe within themselves Having an área created which is a “safe place” where they can get into, is kind of like a hiding place. If they feel safe within themselves they don’t need to “hide” they can lie in their bed and rest accordingly and feel happy about it. Sometimes when crating a dog as a bed, even with a door open, and a dog in question is inside it can present a negative for getting the dog out. For example if the dog doesn’t come out willingly you then have to find a way to encourage the dog out, perhaps for a walk. So another possible negative created. 3. If you’ve not got the dog to come out it wins and stays inside itself. The other side is, crating a dog while adoptants go to work for long period of times is not a possibility for a galgo. When a dogs family has gone, that dog should have the freedom to walk around the space it has been left, play, sit, eat, drink. If it is crated it has mínimum space and no choice. Confined to a space of sorts. It is entirely different crating a dog for reasons of health for example Heart worm. A condition where the patient must remain stationary and in complete rest. Or a fracture. Or medical reason. Once the galgos have learnt freedom at the finca it is encouraged to continue this and recall practice of their name and come, and they opt to settle relatively quickly as they’re hearing familiar phrases. Having your galgo in their own bed allows you the freedom to go and sit with them as and when it is chosen adequate timing for them to be with you. In a crate this is difficult to do. Placing dogs into crates can trigger a smaller environment and can bring back a negative despite the conforts placed inside. Many a galgo can turn a crate over in panic, and if the family members are at work a galgo thrashing around in a crate can cause harm and unecessary stress. Each case may present itself differently, and as mentioned some medical cases may require no movement. Most galgos will welcome a comfy bed, in an open environment with the family. Such amazing pets deserve to be there, a part of the family and most issues can be worked through with patience and timing if there are any. This is a stance of our own feelings towards bed care for the galgos going home, to allow them the freedom to be even closer to their new parents as possible. Once you’ve felt that nose against you, that head on your lap, that nudge, its simply magic. Your new family member is home. adoption, Crates, Important information, transportines. Bookmark.